Well the fall, and with it cider season, is here once again. Last fall in addition to my annual batch of standard cider I did a batch of ice concentrated cider. Part of the ice cider was blended with a strong cider made by fellow homebrewer Steve Gale, which got its boost from the addition of a thick caramel syrup made by boiling down cider. I've got a pretty bad flu at the moment (not sure if it is porcine or not), but I did this tasting over the weekend while it was just starting with a stuffy nose. As a results I may have missed some of the complexity. That said I though both ciders tasted excellent and I would highly recommend either method over adding sugar to your cider which adds alcohol, but does not enhance the apple flavor. Appearance – Big initial head formation, but it drops to almost nothing in just a few seconds. The cider is a nice burnt orange, much richer than any other cider I have seen. It displays some legs in my snifter as well, a sign of both the high alcohol and sweetness. Smell – Big caramelly apple nose with notes of ethanol. Much fruitier than a standard cider, which tend to be light on the apple character. Pretty clean overall (not much yeast character) or other aromas. Taste – Very nice balance between sweet and tart. I can certainly taste some of those cooked notes from the apple syrup, it is similar to the sugary syrup that you end up with in an apple pie (minus any spices). A bit on the sweet side, but it isn't cloying. Still tastes very fresh, no oxidation (either positive or negative). Mouthfeel – The carbonation does a lot to prevent this from being too sticky sweet. The body is much bigger than a standard cider, in beer terms this would certainly be an English barleywine (but it is more sugary than that). Drinkability & Notes – A dangerous cider to be sure, the sweetness helps to tame the alcohol, and the carbonation tames the sweetness. I think these two blended together very well, thanks to Steve for coming up with the idea to match these two. 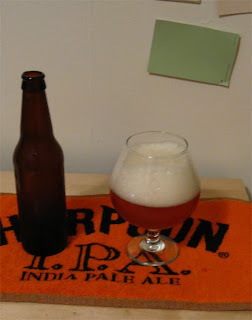 Appearance – Almost no head formation despite streaming carbonation. This one is perfectly clear and a beautiful golden yellow (not much darker than a standard cider). Slight legs visible running down the side of the snifter on this one as well. Smell – Moderate fresh apple aroma with some fresh bready/yeasty notes. There is also a slight sulfury character that may be from sitting on the yeast a bit too long. Not particularly complex (although that could just be the cold I am starting to develop). Taste – Great balance, with just a touch of sweetness neither bone dry nor syrupy sweet. The apple flavor is not really that pronounced, more of a light fruitiness than a specific apple flavor. It isn't too far off of champagne, but it has a nice apple peel character in the finish that reminds you what you are drinking. Not much alcohol to speak of, but there is a nice warmth in the finish. Mouthfeel – Pretty thin, but not as light as I would have expected for ~93% AA. Solid carbonation, a bit spritzy but not fizzy. 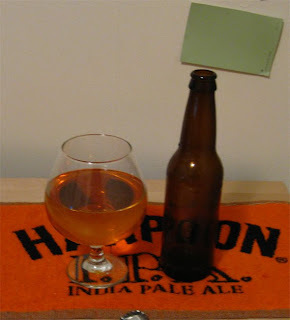 Drinkability & Notes – A pretty solid effort, not exactly what I was aiming for, but a well balanced strong cider. I'll certainly be giving something similar a try this year, not sure if I will aim for a higher gravity or not. perfect timing on this post. i'm planning on starting a cider this fall. this info is a big help. thanks. Wow, does it really take a year to get this good? Both of these have improved over the last year, and for all I know they will continue to improve. I even find my regular gravity ciders take about a year to really come into their own.